Some years ago while browsing through the internet, Jessica Kessel’s shoes caught my eye. They were stylish, playful, feminine, and edgy. Their geometric shape and the unique combination of textures and colors were a breath of fresh air. Her designs rapidly caught the attention of the media and stylists who started featuring her designs in fashion spreads. Last year, Jessica Kessel opened her boutique in the heart of San Telmo, Buenos Aires. Surrounded by antique shops and only a few steps away from the legendary San Telmo’s market, Jessica Kessel's world is a mix of nostalgia and modernity. 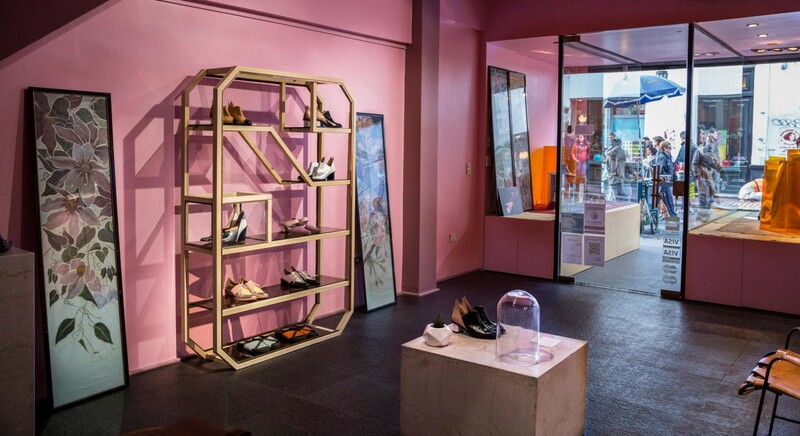 The combination of dusty pink walls, the photographs on the walls and the simple design of the shelves where the shoes are displayed, results in a warm atmosphere where you lose track of time observing the originality of each pair of heels, flats and boots. The moment you start talking to Kessel, you know that she does what she loves. When she talks about her designs, creative process, inspiration and projects, she does it passionately. Kessel belongs to the generation of Argentine designers who benefited from technology and social media in the process of expanding their business worldwide. She constructed her world from scratch; when she started, she took photos of herself wearing the shoes. Jessica Kessel started out as a small project; in three years she began selling in multi-brand stores like Panorama and Editor Market, and last May she opened her own boutique. How did you start designing shoes? I started studying with a shoemaker teacher about four years ago. One thing lead to another and I ended up doing that. I love shoes and since I can remember I've collected them. Apart from that, I was always looking for new styles and designers that had unique collections. There was a moment when everything I saw was uninspiring—there were platforms everywhere. In that moment I thought, "I would like to have this, and that".Then, I realized I could make shoes. Nevertheless, I was connected to fashion because I studied and worked as a fashion stylist with Florence Arguello (one of the best stylist of the country). I started studying fashion design but then I moved to Spain and when I came back I realized that it wasn’t what I wanted to do for a living. Shoemaking was a magic world. I started my training with Fernando López Bizcaino. I remember the day I finished my first pair of shoes and wore them I thought, ‘This is it. I can’t stop doing this, I want more". I couldn’t believe it; I’d cut them, I’d bought the leather, glued them and hammered them. Suddenly I became aware of how hard is to make a pair of shoes and all the processes that are involved in making what you are wearing on your feet that you don’t pay attention to on a daily basis. It’s not the same to make a dress, for example, although there are complex structures in tailoring. In the process of shoemaking there are lots of people working and you have to have vast knowledge to make the shoe comfortable. Jessica's love for shoes was at first sight. She has been collecting different styles since she was a teenager. What are your inspirations for designing a collection? My inspiration comes from very different places, I never start from something specific. I’m observing things and people all the time: how they are dressed, the elderly, what colors they wear. There are lots of things that catch my attention and sometimes they are even, for the common people, ugly, but there’s something there where I find beauty, either in the color or shape. Also, when I travel and have a clear mind and am more connected with my surroundings, I find lots of things to be inspired by. Do you have a favourite place in the world or one that marked you? I think there are lots of places that influenced me. But Europe is the one where that happens a lot. I love Italy—listening to the people talking makes me smile. I love their architecture and artworks. Is there an artist that inspires you? Not particularly. That’s why there isn’t something that I say, "Well, I want everything to come from this reference". All the things that I’m surrounded by every day are welcome. My parents are antique dealers and I grew up around that type of thing, which always interested me. I’m fascinated by the 1920s: art decó, the tailoring of clothing, how women started dressing, the silhouettes and the music. I love jazz, I like going out to listen to jazz bands. That music makes me think about things. It’s not like I sit down and design the whole collection; inspiration comes to me and I draw. Sometimes I’m dozing and different images come to me and then, I think "I want a shoe like that!" As she told us, Kessel’s inspiration comes from very different sources. Since birth she has been connected to the world of art and vintage objects. This constant relationship with art lead to the creation of Communion, a project that she started where she allies with photographers, artists and illustrators to mix her shoes with the world of art and creation. The idea behind the project is that the artists integrate the shoes with their aesthetic, under their rules and inspiration. Since the launch of Communion in 2014, artists like Ani Siraborian, Ana Clara Soler and Ornela Pocetti have collaborated with Kessel. The combination of art and design is very strong in her creations. Jessica sees every shoe as a piece of art. How would you define Jessica Kessel’s style? I think it’s atemporal and playful. I try not to marry any trend and to not receive too much information about what’s trending, because I think that’s putting too much weight on my shoulders. What I try to offer is a shoe that you’ll fall in love with, because that’s what I looked for while in search for a new pair. I remember seeing shoes and thinking, "I love it and I need it". I always had the desire to generate that feeling. I want people see my shoes and feel the urge to have them, with no reason. I think we have to think outside the box . I want people to look down and think that what they are wearing is amazing, even if you are wearing just a pair of jeans or a cocktail dress. What I try to do is to think about the shoe as a work of art, as something special, not like just an accessory, but as the first piece you choose to wear, before thinking about the rest of the outfit. That’s what I aim to do with my designs; create a stronger image with colors and fun combination in addition to good quality and comfort. No, obviously not. It’s important to think about fashion not considering if it’s trendy or not. If you have a pair of shoes, and take care of them, you’ll be able to wear them for the next ten years. Even though Kessel is becoming a recognized designer in the industry, she doesn’t let that interfere in the quality and creativity of her shoes. She does everything with love and attention to the little details, so as to create a perfect pair of shoes that will be cherished for many years. Jessica Kessel world is a mix of nostalgia and modernity. Jessica Kessel collections can be found at her store in Defensa 1009, San Telmo, on her online shop, with worldwide shipping, and in other boutiques across the country. Andrea Urquizu, the designer that brings music, minimalism and clothes together.